Available in 1" and 1.5" Width. Adheres to the fabric of the shirt and the pants. Made of a nylon, hook on hook material 10x the tensile strength of velcro. Unisex belt. Shirt Lock comes in a convenient anodized copper tin for storage. WARNING: Shirt Lock works by using tiny hooks that attach themselves to the fabric, holding it in place. These hooks may cause damage to some fabrics. How long does the Shirt Lock last? Shirt Lock has a 1 Year 100% Satisfaction Guarantee. The Shirt Lock does not work for my waist size. Is there a larger size? It is recommended that you order the 1.5” wide for waist sizes 38” and greater. Figure your sizing based on hip size. Full figured individuals have reported that the 1.5” wide size works better for them. The 1.5” Shirt Lock works well for all waist sizes. If you wear a Duty Belt we recommend the 1.5” variety. How do I stop the belt from riding up in the back? 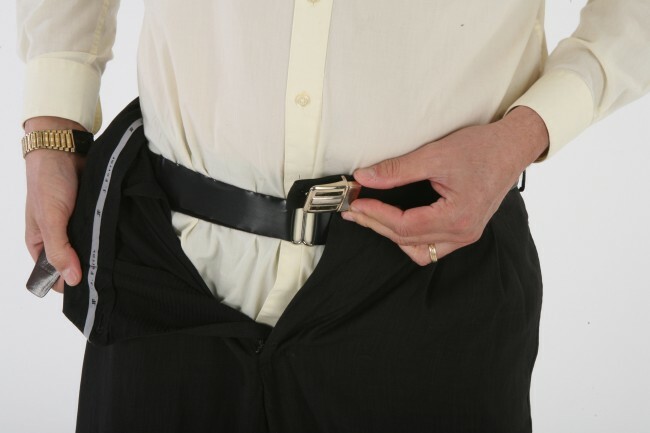 make sure that you place the belt evenly around your waist, (2”) below where you normally wear your garment belt. The Shirt Lock does not grip all the different fabrics. How can I use my belt with the shirts that it does not grip? Some materials have less of a nap for the hooks to adhere to. With the new Shirt Lock there are hooks on both sides and therefore the belt will grip the fabric of the pants and using friction will hold the shirt in place. Also, a ridge is created between Shirt Lock and your outer garment belt that additionally works to hold the shirt in place. The Shirt Lock Does not stick as well to heavily starched shirts. Heavily starched shirts tend to reduce the nap of the material making it harder for the hooks to grip the material. 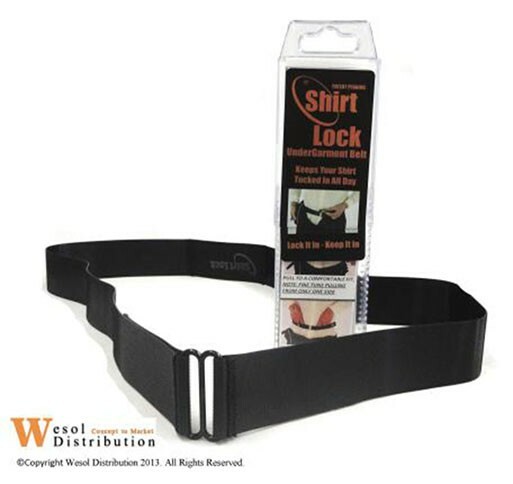 With the Shirt Lock you may find that you do not have to use as much starch on your shirts. However, as stated previously the hooks on the outside of the belt will grip the pants and form a ridge with your garment belt. 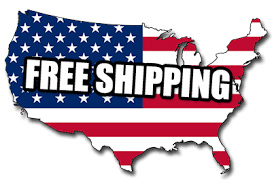 Watch the detailed video demonstration for the Shirt Lock.As always we appreciate your email, comments and phone calls expressing your pleasure, issues and questions concerning our product that has been designed and developed for you the professional Police, Military and Safety officers, business professionals, athletes and sports officials. As always we appreciate your email, comments and phone calls expressing your pleasure, issues and questions concerning our product that has been designed and developed for you the professional Police, Military and Safety officers, business professionals and athletes. Over the years I must have pulled up my pants more than 10 thousand times. Now I don't have to. The belt is comfortable, you can't feel it. I recommend it, it's a simple solution to a problem that's been making me crazy for years. As a Full-time Deputy Sheriff, part-time Firefighter/Haz-Mat Tech and in the military reserve. I have recently purchased a sticky belt. I want to say thank you to your staff for providing such a great product. I just got home and found my package from you guys waiting for me on the table. I was so happy just to try something new out that did not entail me strapping down shirt stays. I opened the box and decided to try it on. I was still in uniform (In Law Enforcement) took off my shirt stays and put the shirtlock on. With a quick tug to get the excess shirt down below my waist I was so impressed at the result. I jumped around, put my hands high up into the air to try to get the shirt to come lose, and nothing. It stayed crisp and tight. Hats off to you guys. I have already told some of the other guys about it. I just got my StickyBelt today and I bought two as my son is in law enforcement. I put it on and tried it and it's an absolute winner.You don't feel it, you don't see it, and it DOES keep the shirt tails in and your shirt positioned properly. Thanks for addressing a very common problem.